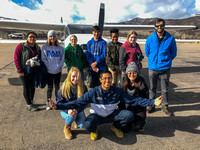 EcoFlight's student programs inform Colorado high school and college students about environmental issues from the unique perspective gained while flying in small airplanes over our state’s wildlands and waterways. Combining overflights in small airplanes with education on the ground, students learn to better understand complex landscape and water issues. The program gives students a unique opportunity to experience landscapes from the perspective of a small airplane flying over environmental issues they are studying. Our flight programs engage students in critical thinking as they explore the complexities of water and public land management in Colorado. With this new perspective and knowledge, students are encouraged to become involved in the important public lands and water issues that we face today.